What a great year, thanks to all of you! We’ve had the most amazing, productive and archaeologically rich year so far. The team showed just how hardy they are by starting the excavation and coring season in chilly February, digging three Iron Age enclosures in the depths of Pamber Forest. That site was all about the charcoal, it looks like there was concerted woodland management and charcoal preparation going on in the Iron Age . Then it was on to the Temple dig with its huge ritual pit, and the infamous horse. 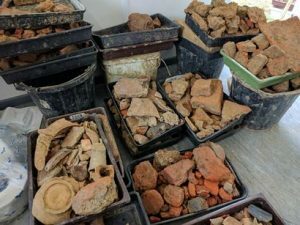 The super-sized kiln site dig ran concurrently where the team dealt with over 4 tonnes of Roman finds! Not ready to lay down their trowels even then, October was spent over near Mortimer at a group of exciting Iron Age banjo enclosures. All of this was supported by you, showing an interest, visiting us, and in many cases helping on-site too so a very big thanks from us. We’re still busily working away on the post-excavation from all these wonderful sites so there’ll be lots more news on prehistoric and Roman life and landscape to come from us next year. In the meantime, we hope you all have a wonderful festive season! Nero stamped at Little London! 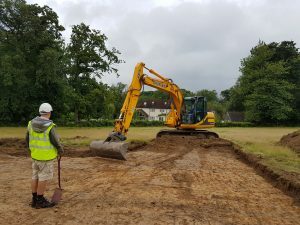 Three weeks into the archaeological excavations of Englefield Estate land at Little London and the Silchester team from the Department of Archaeology has made significant progress and made some exciting finds. A series of Roman kiln structures have started to be uncovered. Some live up to the Little London Tile kiln name of the site and are huge brick and tile production facilities, with an associated quarried out clay pit, full of rejected overfired or broken pieces. There are also two small round pottery kilns, with associated dumps of discarded high quality pottery flagons. The kilns are remarkably well-preserved, with their stokeholes, fuel and possible flue intact. One has a central supporting plinth topped with a line of ‘tegulae’ roof tiles. Either side are larger tiles, used to support the vessels, which have broken under the weight of the collapsed superstructure. Two curved tiles ‘voussoirs’ have also been found – perfect for use in the curved arch of a kiln flue. One edge of the kiln area is defined by a 1.8m deep v shaped ditch, its profile and the scale/ early start to such a large-scale operation all hint at the Roman military being involved. 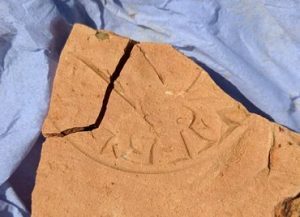 Of particular significance is the extremely rare find of a mis-stamped tile bearing the name Nero. 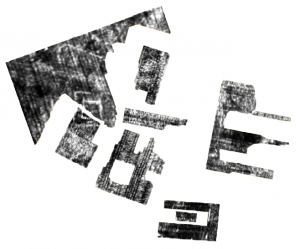 The piece confirms that the site was used in the production of building material endorsed by the Emp eror Nero for use in construction at Silchester. There are only 14 such tiles known in the UK including this one and one found in the 1920s at this site by the Rev, Carslake, plus the examples from the Roman town at Silchester. This example has revealed a new variation of lettering of Nero’s title. From the fragment shown below, it can be seen that the E and R from the contraction of ‘Germanicus’ are joined together and are followed by a small mark as a spacer before the beginning of ‘Nero’. There is no record of Nero having visited England but clearly felt moved to sponsor Silchester during his short reign from 54-68 AD. With two weeks still left to go, the team are confident this site has plenty more to reveal about the industry and Nero’s part in its establishment, we’ll give another update when the dig has finished and the finds have been further examined. There has been a steady flow of visitors to the site, including many members of the local community. 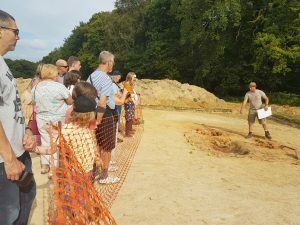 The site is open daily Mon-Sat throughout the dig until 5th Se ptember but in addition, well over 500 people visited the site on the recent open day, where they were taken on site tours and were able to handle many of the artefacts found so far. The team are grateful for everyone’s interest in the work and in particular to Dr Peter Warry, the Englefield Estate and to the Kolosowski family as tenants for access and their encouragement. A Damp but Promising Start. There’s been an excellent start to our big summer excavation season. 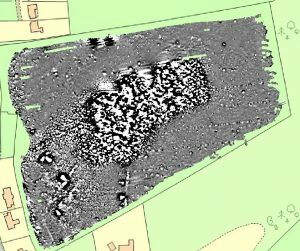 Machining at the Little London Tile Kiln site has confirmed the geophysics results, and more, with a number of large burnt clay and brick structures starting to emerge. There’s clear evidence of Roman activity already! 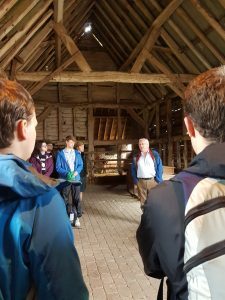 Meanwhile at the Silchester Temple site, Prof. Fulford rallied the troops under cover of a beautiful timber framed barn while topsoil stripping started outside in the monsoon. 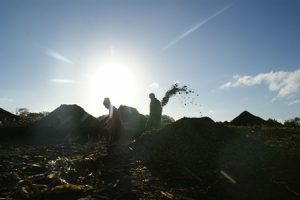 We cant wait for blue skies so we can begin digging in earnest! During our long excavations at Insula IX, one enigmatic find in particular always raised questions whenever discovered. Roof tiles and bricks impressed with a distinct circular stamp bearing the Emperor Nero’s name hinted at some kind of building program funded by the notorious first-century ruler. Examples of the tiles were also found during the excavations of the Forum-Basilica complex in the 1980s as well as the Victorian campaign in the bath-houses in the 1903, perhaps suggesting a town-wide redevelopment. Nero tiles. Four examples from Insula III and a drawing of the 1903 find from the bath-house. Was Nero trying to buy the support of the Calleva locals with a lavish spending spree, or perhaps thanking them for their defence against the Boudiccan rebellion of 60/61AD? Our further excavations into Insula III in 2013-16 unearthed four more Nero tiles, but sadly no more explanations or evidence of the man himself. 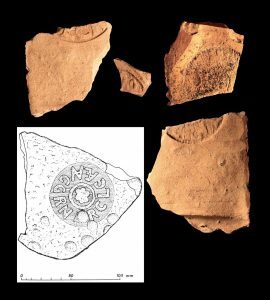 Made of a distinct yellowish clay, these tiles are unique to Silchester with every known example being found within the town walls…..except for one. Geophsyics of the field. A central quarry pit with a number of potential kilns to the southwest. How many can you see? 9th August we will be opening two trenches over a number of these features to find out whether or not these were the kilns used to supply Nero’s Calleva development and hoping to add to our collection of stamped tiles. Earlier this week we dug a couple of test pits in the middle of each of our trenches and things are looking positive already. We’ll be keeping you posted over the next few weeks with all our news and we’ll be revealing more information about how to come and visit us, as well as updates about our open day on Saturday 26th August. On Wednesday 9th August we will begin our summer season of excavations at Silchester Roman Town. This year we will be looking to find a previously-undiscovered temple situated within the east of the town. 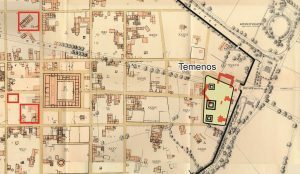 The Victorian excavations of the late 19th Century revealed two temples sat within a walled temenos – an area of land or sanctuary separated from the rest of the town – but only partially identified a third building slightly to the north. 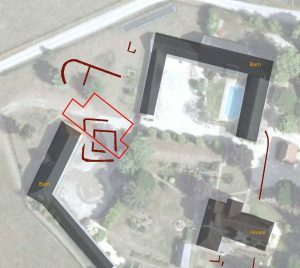 However, our geophysics work has shown the third building to be formed of two concentric squares, the classic layout of a Roman temple. 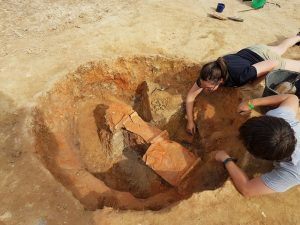 Because of the lack of Victorian intrusion we’ll be hoping to find some undisturbed archaeology within and perhaps discover more about the religious practices of the inhabitants of Calleva. 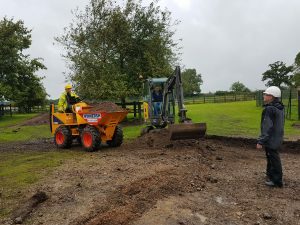 We’ll be holding an open day on Saturday 26th of August for visitors to come and see the progress we’ve made at Silchester as well as our second site which we will be revealing later this week. 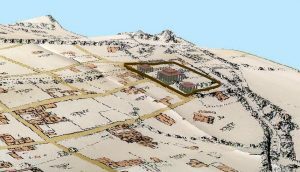 The Victorian antiquarian’s plan of the east of the town shows the temenos wall partially enclosing two obvious Roman temples. Three sides of our targetted building are shown slightly to the north. Geoophysical analysis clearly shows a building formed of concentric squares. Our interpretation of the geophysics including the curve of the temenos wall and our proposed trench. Potential reconstruction of all three temples.